Lung cancer is the second most common cancer in both men and women (not including skin cancer), and is by far the leading cause of cancer deaths among both men and women. Each year, more people die of lung cancer than of colon, breast, and prostate cancers combined. About 14% of all new cancers are lung cancers. 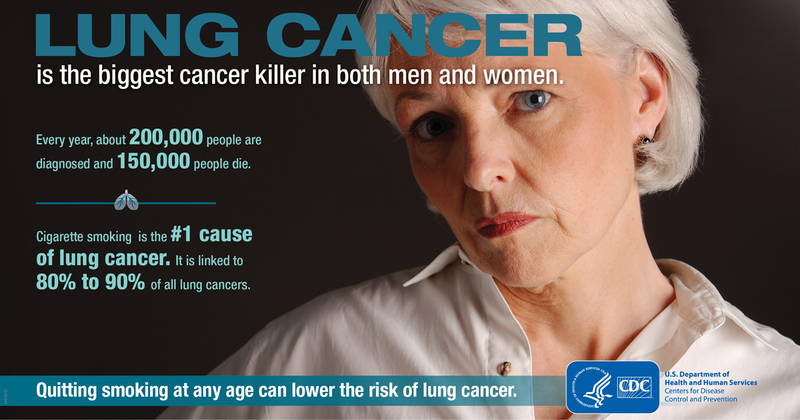 Lung cancer mainly occurs in older people over the age of 65. The average age of diagnosis is about 70. Cigarette smoking is the number one cause of lung cancer. Lung cancer also can be caused by using other types of tobacco (such as pipes or cigars), breathing secondhand smoke, being exposed to substances such as asbestos and radon at home or work, and having a family history of lung cancer. Most lung cancers have already spread widely and are at an advanced stage when they are first found. These cancers are very hard to cure. But in recent years, doctors have found a test, low-dose computed tomography (also called a low-dose CT scan, or LDCT), that can be used for lung cancer screening in people at high risk of the disease. This test can help find some of these cancers early, which can lower the risk of dying from this disease. Don’t smoke. Cigarette smoking causes about 90% of lung cancer deaths in the United States. The most important thing you can do to prevent lung cancer is to not start smoking, or to quit if you smoke. Avoid secondhand smoke. Smoke from other people’s cigarettes, cigars, or pipes is called secondhand smoke. Make your home and car smoke-free. Get your home tested for radon. The U.S. Environmental Protection Agency recommends that all homes be tested for radon. Be careful at work. Health and safety guidelines in the workplace can help workers avoid carcinogens—things that can cause cancer. For more information about radon exposure and testing visit the ADPH Radon Program. Also visit ADPH’s Tobacco Prevention and Control for more information and available resources.